Facts about Anaconda Snakes. "Scientific name for Anaconda Snake is Eunectes murinus". Anaconda Snakes are one of the most beautiful snakes in the world. The Amazon jungles of South America and flooded Pantanal region (Western Brazil but extending into Bolivia) of Venezuela, is well known Anaconda habitat, its where the Anacondas call home. They are part of the Boa Constrictor family. 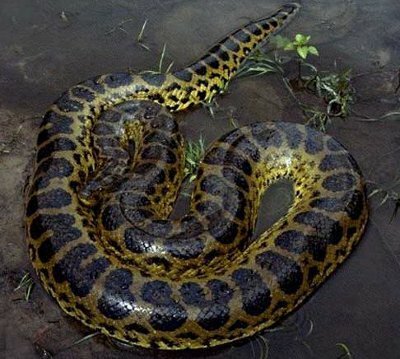 Anacondas, also known as water boas. Anaconda is derived from "Eunectes", which in Greek means (good swimmer) and the Latin word "murinus", (of mice) Presumed preying on mice. Anacondas are loaners and like to live near lakes, swamps and rivers. When they are threaten they like to hide in the water, that's why you will find them primarily close to a water source. Anacondas give birth to live young, around 20-32 at a time. Anacondas mate in a very unusual style of behavior. The ovulating female attracts Several males resulting in a (mating ball) that can often hide the female from view. The mating always takes place in water. After a gestation of six months the females give birth to live babies in April to July, the wet season normally coincides with their birth in the Anaconda Snakes native range. If Anaconda Snake were to come across a person in the Jungle it would most likely slithering away, because they don't have much reason to attack a human, they will usually only attack if they feel threatened.